Without a proper exhaust sound, many cars would lack the unique experience that they are known for. These are the ten best sounding highly-tuned exhausts. What better way to be reminded that you’re in an extremely powerful Italian sports sedan than to constantly hear its undeniably Italian exhaust noises? By using a series of electronically opening exhaust valves, the Quattroporte GTS’ is able to maintain its status as the bossiest and loudest Italian sports sedan on the road. But maybe not for long. Let’s face it, without its extremely characteristic noise, the current 500 Abarth just wouldn’t be as fun. Its putt-putt noise is unmistakable and attracts only the best kind of attention wherever it goes. I guess that’s what happens when you sell a car direct from the factory without a muffler. Other sports cars might have the screams and the thunderous cracks down pat, but there is no other car out there with a roar like a Hellcat. Thanks to specially-designed electronically controlled exhaust valves, the Hellcat can roar like demonic hell-spawn that it is. On the current generation Corvettes, the Engine Sound Management system allows for the driver to change exhaust modes from stealth to track. Stealth has near hybrid levels of quiet, while track has near full-on race car sensations of loudness. It’s all controlled by exhaust baffles and butterfly valves in the piping below the car. Call me a child, but some of the most addicting things about the 458 are the noises it makes when the exhaust baffles open up. Waaaa-pow, waaa-powww. I swear I could listen to it all day. Until you get the 458 above 3000 RPMs, exhaust is only flowing through the center tailpipe. It’s only above 3000 RPMs that you can really notice the engine coming to life. Above 3000 RPMs, exhaust baffles open and allow exhaust gases to flow through the two louder outer tailpipes. The AMG GT exceeds expectations in many ways. But can its downsized and turbocharged 4.0L V8 continue the legacy of the famed 6.2L AMG burble? Mercedes-Benz offers a brief explanation of how the AMG GTS’ exhaust system does its thing. Computer-controlled vanes near the tailpipes of the AMG GT S exhaust system also let the driver escalate its sound at the push of a button, while the system’s free-flow design delivers an audible celebration of power with every upshift, downshift and rev. When spending time in a modern McLaren, it’s impossible to ignore how science-fictiony and unique the noises it makes are. From the whooshes of the wastegate to the noises of wide-open throttle, the noises of the 12C are pure beauty. To achieve the 12c’s spaceship-like series of noises, McLaren fine tuned the headers acoustically and designed the exhaust system to allow a small amount of exhaust and wastegate noise flow into the cabin. Crack crack crack pop. In the V8 Jaguar F-Types, its almost impossible to keep a frown on your face. The noise that these cars emanate might be a bit over the top, but that’s okay. Unless you’re going to a wedding or something, then it’s probably not okay. Don’t drive your F-Type to a wedding. As explained in detail here, Jaguar uses “controlled misfires” to make the F-Type’s exhaust as exciting as many of us know and love it to be. To create these controlled misfires, Jaguar has engineered the F-Type to delay fuel cut off after the driver has lifted from the throttle, thus creating the controlled misfires. When you switch the Huracan into “Corsa” mode, it’s like you’ve been hand picked to serve as the Earth’s God of Thunder. Upon letting off throttle and on downshifts, the Huracan makes some of the most insane noises that have ever resonated from a supercars exhaust. It might be somewhat artificial, but I don’t care. As Lamborghini’s original press release for the Huracan states, most of the work is done by the car’s striking V10, but the exhaust wouldn’t be as insane as it is without all the extra tuning and the channel setup that Lamborghini had used. The exhaust system is also conceived with two channels, with its components laid out for low back pressure. There are flaps in the two end pipes; the vacuum formed at higher loads and revs causes them to open, giving a fuller, deeper sound. There’s no way that the incredible V10 hiding under the LFA’s hood needed much help to perfect its tone, but Lexus wanted to be sure. 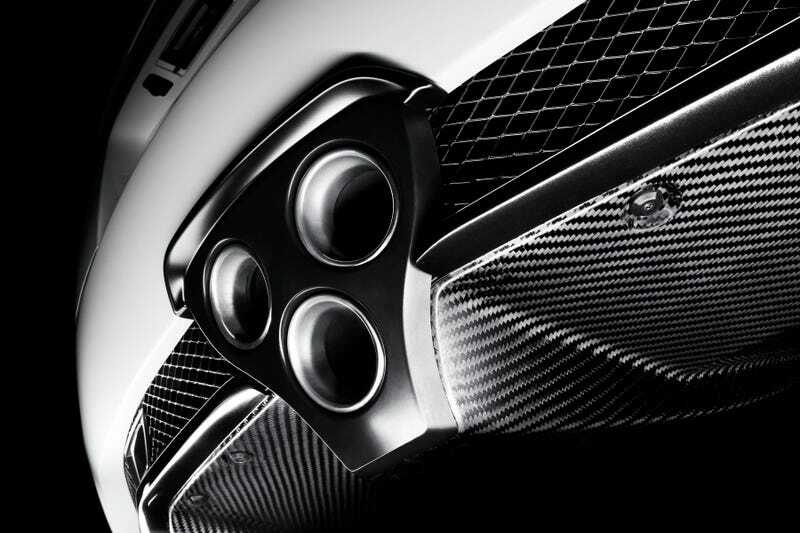 To ensure the LFA’s exhaust perfection, they hired engineers from Yamaha Instrumental to make sure that the LFA’s scream was the screamiest of screams.